Network Rail have started to re-new the track at Walkden, working overnight and on Sundays over the next month or so. 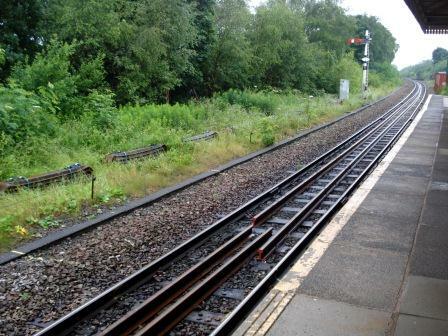 The new rails and metal sleepers can be seen stacked up at the station already (left). As of tomorrow there are no Sunday trains to or from Walkden until 7th August. Bus replacements will be provided but … they do not run to the same timetable, are slower, have no toilets, and will not carry wheelchairs, bikes or prams. Late evening services during the week are also affected: from now until 12 September the 22.27 departure from Wigan and the 23.20 from Manchester will also be placed by buses every Monday, Tuesday, Wednesday and Thursday. Please refer to the National Rail Enquiries website for full details of the disruption and replacement buses if travelling on a Sunday or late weekday evening. Walkden gets Spruced-Up for Summer ! Walkden Station “In Bloom” !